Nairobi — Of the 21 people killed in the Tuesday terror attack at Riverside Complex, six were senior managers at Cellulant. This makes it the firm at the complex that suffered the largest number of fatalities from the deadly attack that was staged by four heavily armed terrorists and a suicide bomber who blew himself up on arrival. The management of Cellulant, an online payment provider in the region, has released identities and detailed profiles of its staff who died in the attack. Dusit hotel lost 4. They include a product developer, an information security expert, a manager, a quality assurance officer, a software engineer, and an implementation engineer. Ashford Kuria headed the Product Development Department, with Cellulant management saying "His knowledge of everything about everything was hilarious because he spent much of his time quietly working on his projects." "Mwaniki's intelligence in matters cyber security is said to have won the company he worked for a much coveted certification from the International Organization for Standardization (ISO)," Cellulant, founded in 2004, said in a brief tribute note shared online. "His intellect and quick thinking, got Cellulant our ISO27001 information security certification," the company co-founded by Ken Njoroge and Bolaji Akinboro said of him. "He guided his team with humility and corrected with humor. He loved God and everyone he came across and challenged his team to work on bettering themselves." "He was passionate about service improvement and worked on all the projects. John was best known for humor," Cellulant remembered him. "Kelvin will be remembered as an intelligent and a competent engineer who worked in the Hub Implementation Department as a Hub Developer," the company said in a tribute it released ahead of a memorial service in remembrance of its staffers at the Christ is the Answer Ministry (CITAM) on Valley Road on Tuesday next week. "Wilfred was always happy and an individual who never shied away from any difficulties," Cellulant remembered in the tribute note. 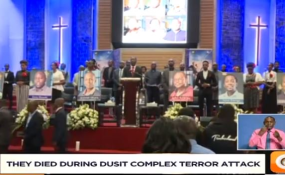 The company's Chief Executive Officer and co-founder Ken Njoroge told Capital FM News on Saturday the management was focused on offering any support it could to the families of the six staff members who died in the 14 Riverside Drive attack. Njoroge refrained from making further comments saying detailed tributes will be read Tuesday next week during a memorial service at Nairobi's CITAM Valley Road at 10.30 am.